You’ve probably arrived here because you want to make something happen. Do you just go for it and do the first thing that seems appropriate? Do you spend weeks planning until you have it all figured out before you make the first move, only to have lost the motivation to do anything by the time you’re ready to start? You’ve probably guessed that neither of those are great strategies for achieving your goals. Success comes with a blend of planning and doing. Spending too much time planning will get you nowhere. Having no plan is criminal. But how do you find that balance? How do you know which bits of planning are important, and which bits you can skip? This dilemma will drive some people to plan and plan and plan until they can stand it no more, then move on to their next aspirational goal, which never materialises. Others will dive in and do random things without understanding their value, and work themselves to the bone, until they become disheartened at lack of success and give up. Some folks will dive in, accidentally hit on the right tasks work hard and be successful. It’s these people that then perpetuate the myth that success is only about hard work and persistence, and that everyone must slave for years to have any form of success. Of course these folks aren’t wrong – success does come from hard work and persistence but they aren’t totally right either. It’s about hard work and persistence on the right things. And zero effort on the wrong things. Project.Done. is designed to show you the right balance of planning for any project, and provide you with a set of tools to determine what the right things to be working on are, and what you can ignore completely. Project.Done. gives you the tools which show you how to achieve 80% of the results of your project with 20% of the effort. Even with a plan, most goals worth achieving can seem endlessly far away, and the steps involved so huge that you could never imagine completing them. Project.Done. shows you how to break impossible task down into manageable chunks, which you can complete quickly. It also tells you which of those manageable chunks are simply not worth bothering with. Sound good? How about bullet proofing your project from self sabotage and distraction to guarantee you follow through and make it happen? 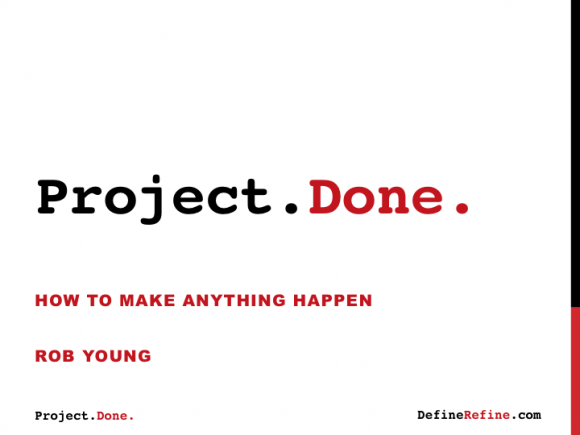 What about making sure this project is the single most important thing you could be working on right now? How do you know if you should you just forget it and do something else? What about a simple process to figure out your priorities, goals and create the worlds simplest tool to make sure you always make the right decision for your project? Would you like to shape your project so that it takes advantage of the things you’re naturally brilliant at and that you love? Even better, how about you banish the boring tasks that leave you cold, leaving you energised to be even better at those tasks worthy of your effort. If this all sounds good to you, then you owe it to your project to invest in a copy of Project.Done. Project.Done. is not a universal silver bullet which will make things happen magically, but it’s the nearest thing available to a laser focussed target for your efforts. It’s the thing that lets you focus your considerable talents at the right things to achieve results that far exceed what you thought you were capable of. Ok, you want more details? Project.Done. distils my 15 years of experience making projects happen into a 65 page workbook which takes you from beginning to end of a project and back again. It’s long enough to be comprehensive, but short enough to read in one sitting while your motivation is still hot. It contains 11 guided worksheets and a series of questions to help you work through the specifics of your project, and make the tools totally bespoke for what you’re doing right now. It culminates in a one page reference guide which you’ll create along the way. Stick that to your wall and always know what the right thing to work on next is. Project.Done. is part reference guide, part workbook – you’ll refer back to it again and again during your project, and you will never start something again without spending an hour or two filling it in. Use it for as many projects as you want. I challenge you to find a better investment of $39 for your project. You owe it to yourself and your project to give it the best chance of success.